The Autumn/Winter Collection is now Live! Despite the heat wave we continue to be experiencing here in Vancouver, our fall pieces are now available! 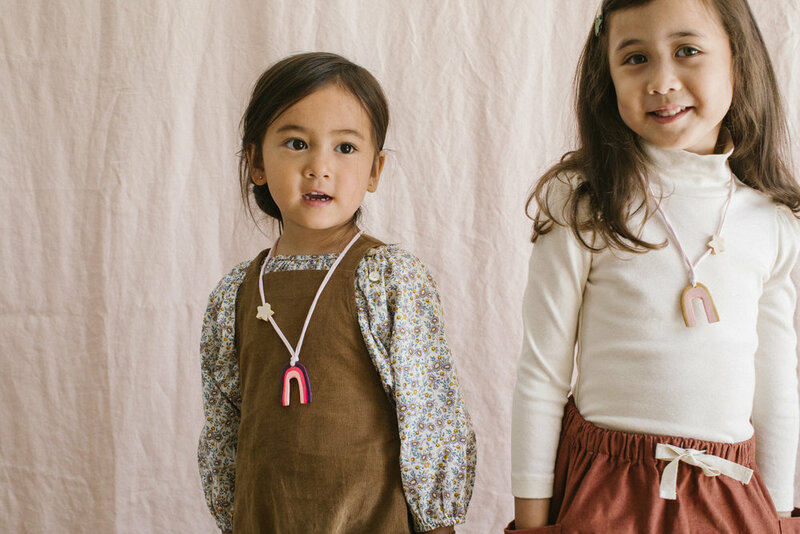 Get ready to accessorize your cozy autumn outfits with these sweet new pieces, including brand new Rainbow designs and a new Frida geo doll, as well as new petites, acorns, honeycombs, and cloud tassels. Hope you like the new colour ways and styles! Shop here. We are so excited to be working with Tara from Pocket Folk once again on the geo doll designs, and new this season, with Kellie Diguangco on the new rainbow designs. Many thanks to our collaborators in the AW18 photo shoot: Petits Vilains clothing, Small Lot Co. shoes, photographer Maria Lang, Flax Sleep for the gorgeous backdrop, and our adorable models. We are looking for some sweet kiddos to join our AW photo shoot! Must wear either size 3 or size 6, and live in or be able to travel to Vancouver. The shoot will take place July 22 (tbc) in both outdoor and indoor locations. Professional modelling experience not required, but a comfort level with photographers and other children is a definite plus. Please email coralandcloud@gmail.com with 3-5 photos of your child, and let us know your contact info and the size your child wears. Deadline to apply: July 7.